"We make these for a quick snack while watching movies or for an easy kid pleaser. They are not the most fancy nachos, but they taste great." Arrange the tortilla chips on a microwave-safe platter. Shred the sausage with a cheese grater; scatter evenly over the chips; top with Cheddar cheese. 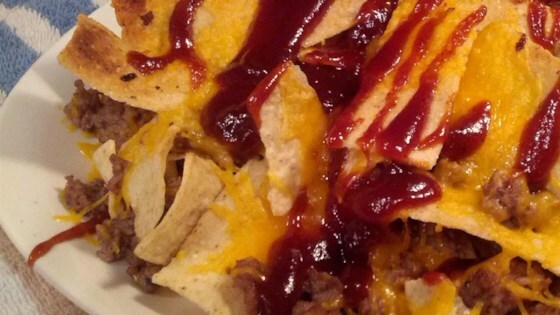 Drizzle the barbeque sauce over the nachos. Heat in the microwave until the cheese melts, 15 to 30 seconds. It ok , the sausage was hard to grind though. This is one of my favorite snacks. It is a weird combo but it really is good. It's a million times better if you put them on a baking sheet and in the oven for about 10-15 minutes. I usually set the temp to about 375-400. And check on them after ten minutes. Yum, yum, yum.